Items are listed by page and by category On this page you will find a complete menu of our marketing products for real estate agents. We have a large assortment of signs, posts, frames, wire stands, wooden stakes, and steel stakes. Almost every product for marketing assistance for the sales agent. We make small and large real estate yard signs. We have the large and small Directional Realtor Signs. This is a great product for marketing. For every real estate agent, we have the Sign Riders, that lists the name and phone number. Realtor Signs that are shaped like a house. To Hold Realtor Signs – 3 Economy Styles of wire sign stands. These are popular economy wire stands. The steel stands are using 1/4 thick steel rods and commonly used for realtor signs. Realtor Signs that are House shaped, and wire stand frames sign products. 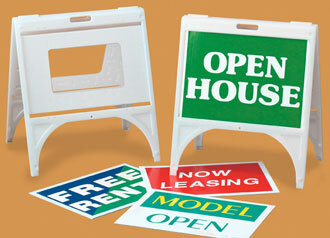 We have a large selection of steel sign frames and sign posts for real estate agents. We have a large selection of steel stakes and steel posts widely used for real estate posts. Also several size of real estate wooden stakes. These are portable units to be used as real estate sign posts. Portable Sign Frames at discount cheap prices. To Hold Realtor Signs 3 Economy Styles available. Buy yard signs and receive 5 to 10% discount on above products when purchased at same time. The Slide-In version of frames is distinctive by their built in loops that are used to hold the panel in place. There is no need for holes or screws, just simply drop your panel in and you are ready to go! The real estate sign posts are the slide in version. Pictured above is a photo showing how the loops hold a panel in place. These loops are positioned around the edges of the frame to hold the panel in place. The loops are pressed out of the angle to form a secure and efficient method of panel assembly. These units will accommodate substrates up to 1/4″ Thick. The “Slide-In” frame is made from 3/4″ angle iron. The legs are pointed for easy ground insertion. The frame is designed to be easy to use and assemble, simply drop your panels in and you are done!